MANILA, Philippines — Ronald Ventura is in a secret lair, fielding questions from the Japanese. Let’s qualify that for a bit: Ventura has just taken an art professor, a documentarist and a gallery owner from Tokyo (along with their interpreter) on a tour of his latest one-man show titled “Bobro’s World” at Secret Fresh in Ronac Art Center. They have now installed themselves in a bar surrounded by toys, collectibles and a portrait of Johnroy Alferez – wearing a white hoodie, flanked by Mr. Lion and Mr. Wolf. (If that sounded like a Tim Burton sketch, well, yes… in a way). Over coffee, the visitors are trying to make sense of the mystery that is Ronald Ventura. 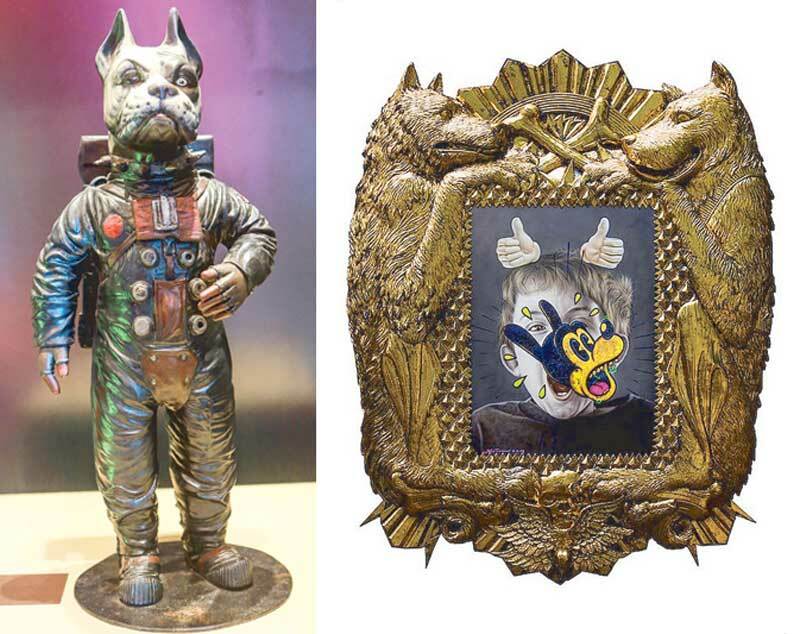 The art professor talks about the multi-layered artworks: an amalgam of hyperrealism, cartoons, comics, anime, text, Pop Art tropes, esoteric symbols, omnipresent emoticons and dogs (lots of “heckin’ doggos”). One painting alone contains a multitude of styles and subjects (a cosplayer, for example, is superimposed with an image straight from sci-fi), an artistic strategy that Ventura has pursued in the past few years. He credits this to being bombarded by images every day, from television to the internet. “Is there a Catholicism dimension to this painting?” asks Professor Kunio, zoning in on a work titled “Hotdog Society.” Ronald answers that Catholicism is ingrained in our culture, our lifestyle. Artist Ronald Ventura poses with guests in front of Bobro’s Installation. On the cover: The artist with Hot Dog Society. Ventura has sacrificed a lot to the altar of Art. 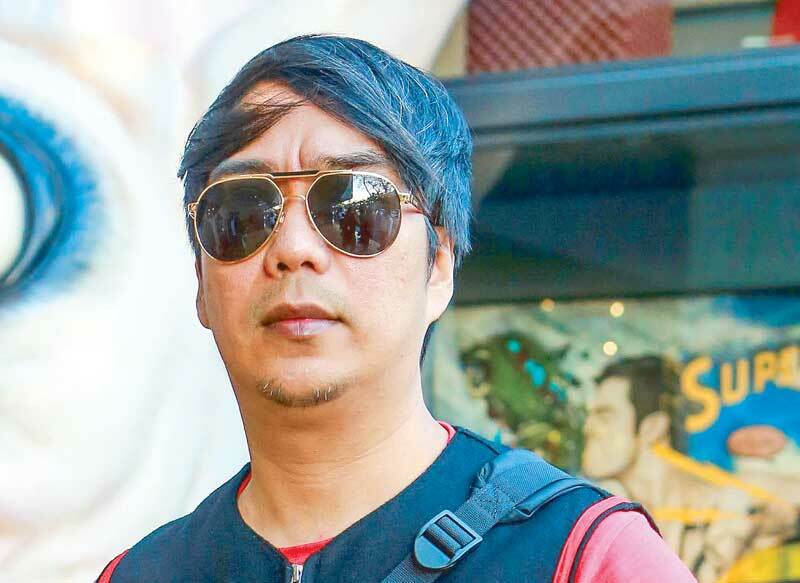 Most people know him as an auction star whose “Grayground” painting was sold for a record-setting P46.9 million at Sotheby’s. He continues to set gavels on fire in auction houses; mount sold-out shows in Milan (Primo Marella), New York (Tyler Rollins Fine Art) and Tokyo (Whitestone Ginza), among other cities; and headline museum exhibitions. He is set to take part in an upcoming show at Piazza San Marco, Venice – coinciding with the biennale – presented by Karuizawa New Art Museum. But the road to success has been riddled with slings, arrows and a host of non-believers. Ventura’s origin story is quite an eye-opener. Ronald is the son of a waiter father (who worked kitchens in Riyadh, Saudi Arabia) and a teacher mother (Tonsuya Elementary School). The Venturas lived in a cramped apartment in Malabon. There were perennial floods and money problems. But the boy showed flashes of brilliance early on. He would also enter empty classrooms and fill the blackboards with chalk drawings. In high school, he seemingly was a fully formed portraitist. You would see bulletin boards adorned with portraits of Michael Jackson and Billy Idol executed in pencil by Ventura. His fine arts thesis at the University of Santo Tomas was talked about on campus – even by students who were not able to see it. It was like Godot, man, but more apocalyptic. There was a buzz, all right. But seldom written about Ventura (aside from the man spending nine challenging years as a full-time art teacher) were the doomed alliance with a Mephistophelean gallery owner, the falling-out, the fights and various rifts with various figures in the art industry. Lots of vultures in the barrio. Even now, a couple of artists are waiting with bated breath for Ronald to chart disappointing figures at Sotheby’s or Christie’s – like a murder of jealous crows. 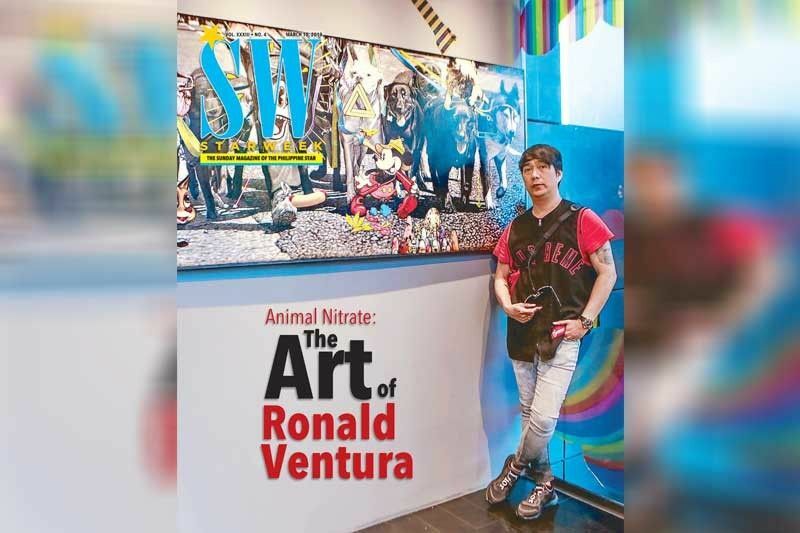 One influential, velvet buzz-saw of an art critic was not really a believer in Ronald’s work, well, until the artist bagged the grand prize in the prestigious Ateneo Art Awards in 2005. Well, isn’t that rich? That was a turning point in Ventura’s career. He was awarded a studio residency grant to Sydney, Australia, allowing him to visit museums and galleries, to see artworks he used to see only in books. Singapore followed soon after. And then the rest of the world took notice. No looking back after that. Literally, says Ronald, for he became too focused in his artistic practice, in his own tortured, carnivalesque world. 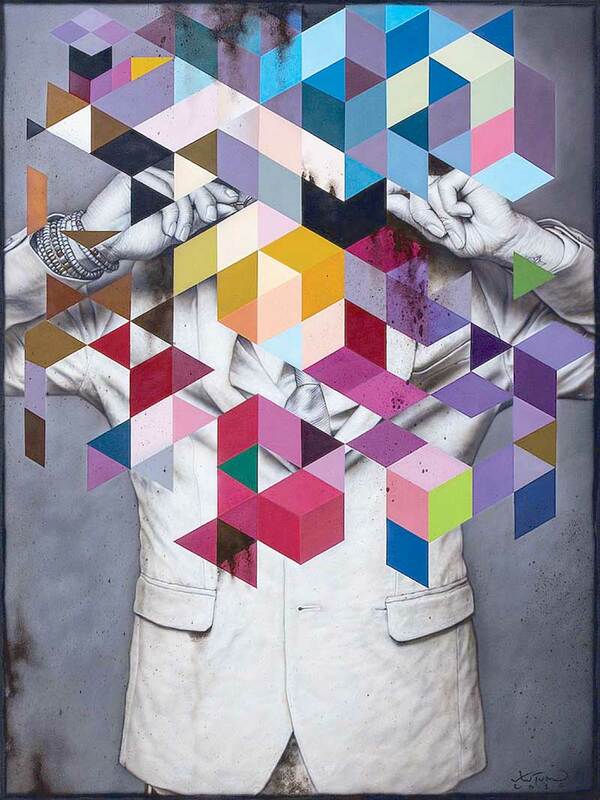 Ronald motions to a painting titled “Color Blinds” in his Secret Fresh show depicting a man in black and white getting “erased” by a geometry of colors. “I started this piece two years ago. This is where I began defining color differently, not just for symbolism.” Treating color almost like another character altogether. When did you realize you wanted to pursue a career in the arts, someone asks. 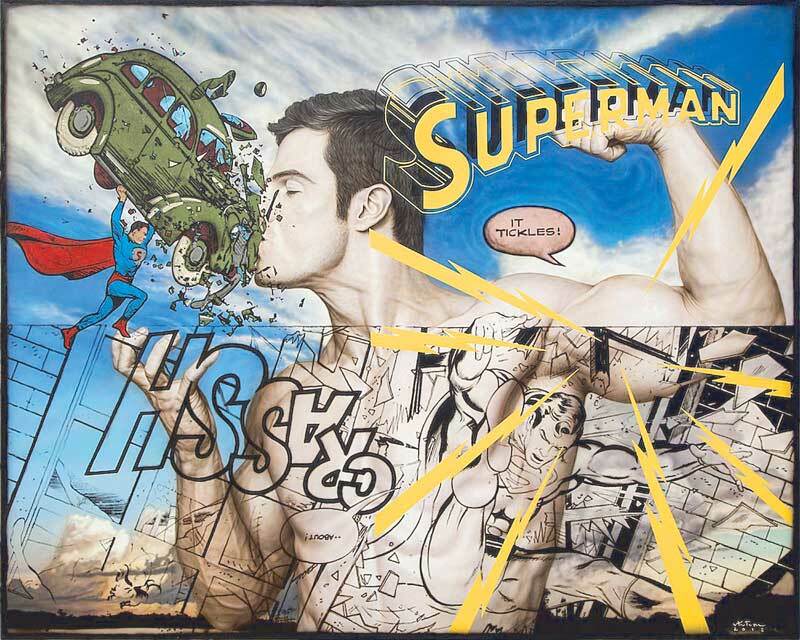 He adds how this observation has become enfleshed in his artworks characterized by a riot of imagery. 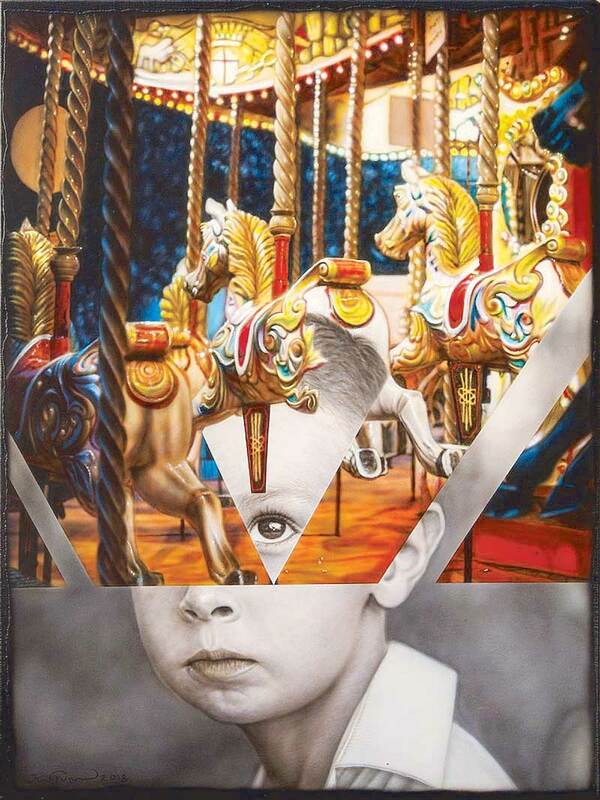 Ventura calls it “imagination in animation.” “Blinders” depicts a boy superimposed with a carousel. Maybe it is related to Ventura’s recollection of fun times at Fiesta Carnival in Cubao as a boy. How this motley-colored memory boxed-out the less colorful incidents in his childhood. 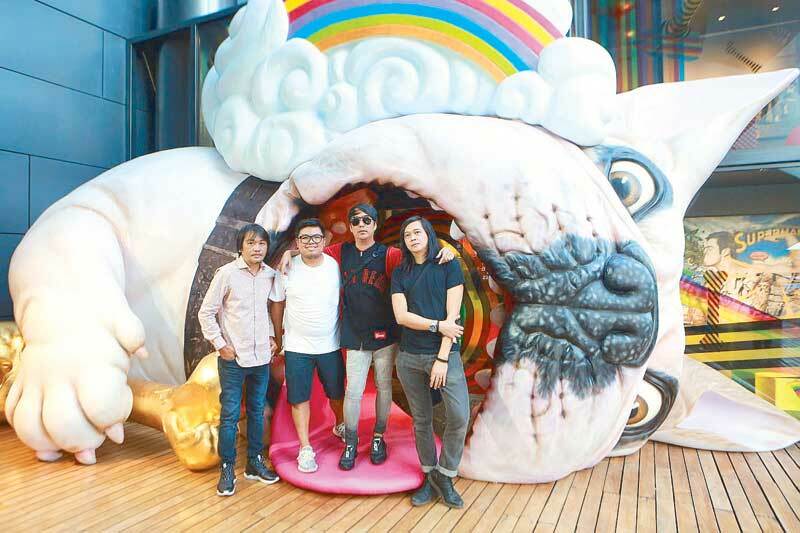 Before the night is over, Ronald would meet up with friends (DJ Bigboy Cheng and curator Ruel Caasi) and talk to them about what grown men hold dear: family, cars, shoes, dogs, etc. When Ventura goes home, the blank canvases will be shroud-white, stretched and primed. Figures ready to curl into light, worlds waiting to be born. And Ronald Ventura must dream them all up again. Ronald Ventura’s “Bobros’ World” runs until Mar. 23 at the SixInch Gallery, Secret Fresh, Ronac Art Center, Ortigas Ave., San Juan. For information, call 570-9815 loc. 7 or email secretfreshinfo@gmail.com.